Hi Unity fanatics! :) It's that time again...Friends with Flair Friday! Woot woot! Please check out the Unity blog to see a complete list of bloggers participating in the hop today. One lucky commenter who finds the FWF blinkie will win stamps...gotta love that! Last week, I was the lucky winner! I could not believe it. Thanks Unity! Great job on this! LOVE the pink! I just ordered this kit! I read in your profile that you are starting a stamp company! Hope that is going well! I just love this card! The colors are great.. I just love this card. It's fresh, bright, fun, and a little funky. Great combos all around. Fabulous, fun card! Love it! Isn't Raspberry Fizz the greatest? I got the CS and ribbon. Cute card! love this Anita.. great card love the flowers. What a totally cute card! I love the sparkles on the sound waves!! Sooo clever! Too fun! Love your rockin' boom box! 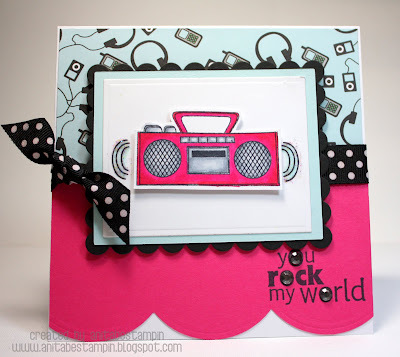 So cute - love the boom box and the bright pink of the paper! Such a cute card :) I need to jump on board too and get some of that Raspberry Fizz~gorgeous fun color! You go girl! Love it!